Scrambled? Fried? Poached? However you like them, today is World Egg Day. 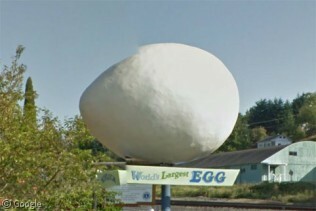 What better way to celebrate than with the self-proclaimed ‘World’s Largest Egg‘ in Winlock, WA? This 4m (12’) egg would make a lotta omelette if , you know, it was a real egg … instead of being made of concrete or something. Enjoy your breakfast!